Wag your way to a stress free working environment! Our TheraPaws dogs don’t just help those who are suffering from illnesses. They can also have a fantastic impact on the general wellbeing and productivity of your team. In return for a donation to Mayhew, we can arrange our TheraPaws dogs to visit your office and help your staff de-stress. One company who made the most of our TheraPaws programme is cruelty-free cosmetics brand, Smashbox. TheraPaws volunteers, Deborah with her dog, Noodle, Claire with her dog, Roobarb, and Jude with her dog, Alfie, spent time meeting and engaging with employees from their head office in central London. All eyes were on our TheraPaws dogs as they paraded in with their tails wagging ready for plenty of cuddles and fuss. And they weren’t disappointed as they were quickly rewarded with big smiles and lots of affection. Not the right time for a visit? 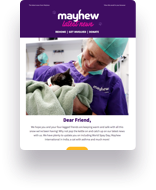 There are plenty of other ways your business can get involved with Mayhew. Are you interested in having a TheraPaws visit to your office? Please get in touch!